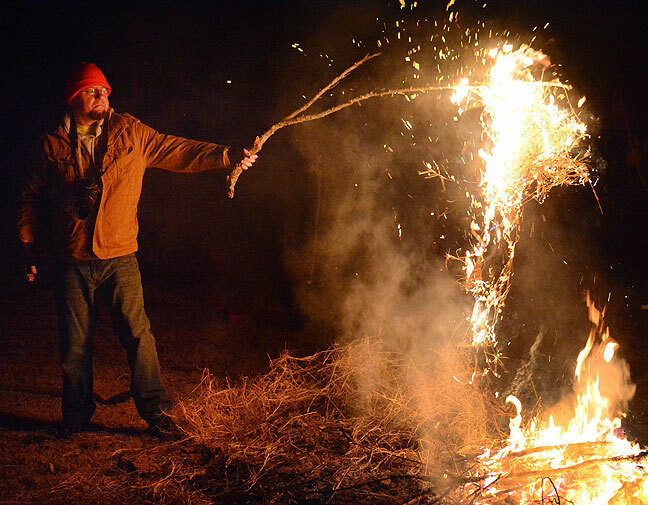 Dan Marsh lifts a branch full of dry grass from my fire last night. As winter grew drier and my brush pile grew larger, I decided I needed to burn it sooner rather than later due to the potential for a burn ban. I had some time last night, and with a light rain earlier and snow in the forecast, it seemed like the time. Lit only by the brush fire, Dan makes pictures of the flames. 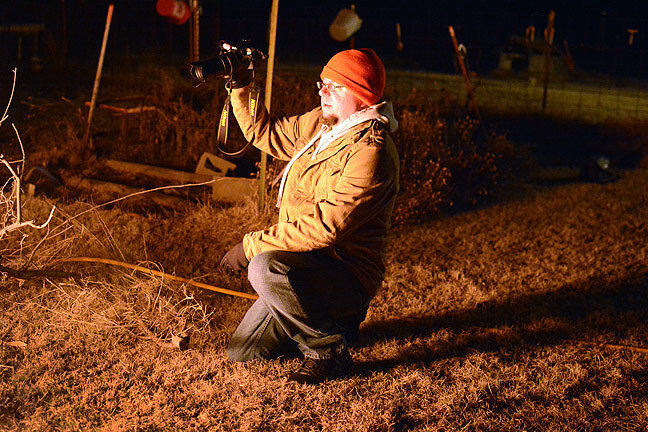 I invited Ada News Editor Dan Marsh, who not only helped me keep an eye on the blaze, but also had a great time photographing it (link). For me photographically, it was a chance to push the limits of my new Nikon D7100. I shot at ISO 6400, and the images are fairly clean. I burned all the branches and logs that had accumulated in the pile over summer, plus all the branches I pruned from the fruit trees last month, plus all the marigolds and tomatoes from the garden. Due to a modest north wind, the fire burned faster than usual, but at no time did it seem to get out of control. 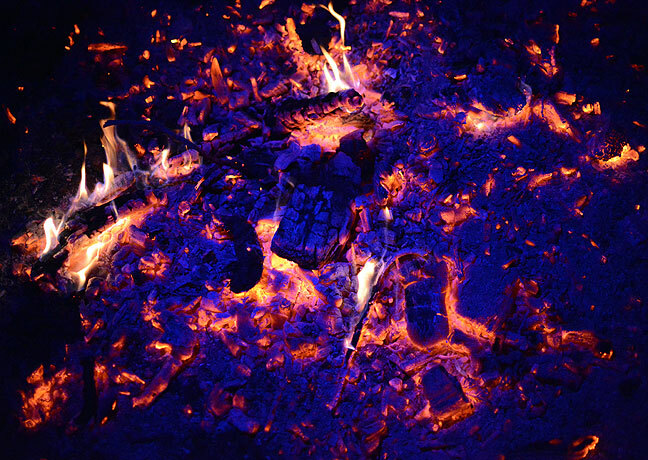 As my fire went to coals, I played around with illuminating it with a red-blue-white selectable flashlight. This image was made at ISO 6400. The night was cold, but the fire itself and the work of gathering fuel and tending the fire kept me warm. Dan left about three quarters of the way through, and I tended in silence thereafter. Finally, I buried the coals and came inside to Abby. My wife and I slept late, then awoke to snow. 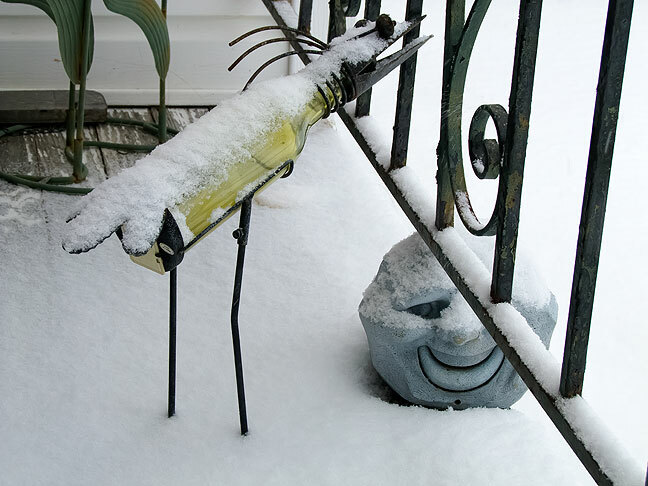 Snow clings to some of Abby’s lawn ornaments on our porch this morning. The middle pic of the embers is stunning. I want a print, please it is so beautiful!